The circadian system and sleep-wake rhythms are closely interconnected. Clocks in the brain control when we are tired or alert. Furthermore, how our body deals with sleep loss depends on the function of our clock machinery. On the other hand, sleep can act as a timing signal to reset molecular clocks and sleep and clocks together regulate various physiological processes - particularly in the context of food intake and energy metabolism. We are interested in the underlying mechanisms. We were able to show that a shift in the sleep phase in mice disrupts circadian transcriptome rhythms in liver and white adipose tissues. How this effect is mediated on the molecular level is in the focus of current experiments in the lab. Tissue-specific dissociation of diurnal transcriptome rhythms during sleep restriction in mice. Husse J, Kiehn JT, Barclay JL, Naujokat N, Meyer-Kovac J, Lehnert H, Oster H. Sleep. 2017 Apr 24. doi: 10.1093/sleep/zsx068. 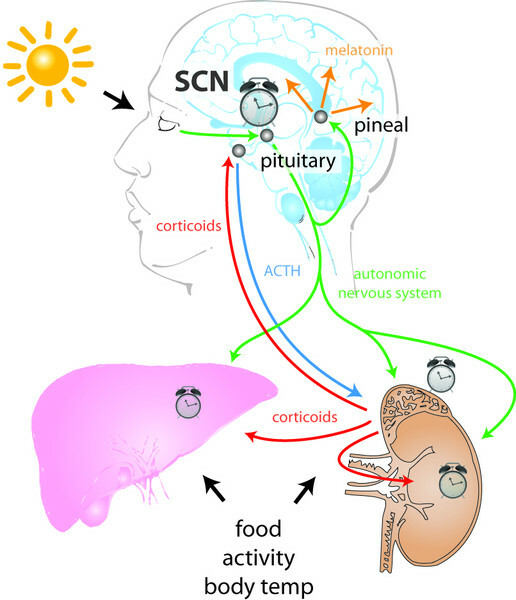 How sleep and wakefulness influence circadian rhythmicity: effects of insufficient and mistimed sleep on the animal and human transcriptome. Archer SN, Oster H. J Sleep Res. 2015 Oct;24(5):476-93. Loss of circadian clock gene expression is associated with tumor progression in breast cancer. Cadenas C, van de Sandt L, Edlund K, Lohr M, Hellwig B, Marchan R, Schmidt M, Rahnenführer J, Oster H, Hengstler JG. Cell Cycle. 2014 Oct 15;13(20):3282-91. doi: 10.4161/15384101.2014.954454. High-fat diet-induced hyperinsulinemia and tissue-specific insulin resistance in Cry-deficient mice. Barclay JL, Shostak A, Leliavski A, Tsang AH, Jöhren O, Müller-Fielitz H, Landgraf D, Naujokat N, van der Horst GT, Oster H. Am J Physiol Endocrinol Metab. 2013 May 15;304(10):E1053-63. The acute light-induction of sleep is mediated by OPN4-based photoreception. Lupi D, Oster H, Thompson S, Foster RG. Nat Neurosci. 2008 Sep;11(9):1068-73.